The U.S. Navy submarine John Warner launches Tomahawk missiles from the Mediterranean Sea on April 14, 2018, as part of a multinational strike operation against Syria. Last month’s final order of replacements does not even return us to pre-Trump levels, and at the current rate, the total inventory would run out in about five years. In order to deter potential adversaries, they must believe that we have both the capability and the will to retaliate. Opponents must believe that we can and will hit back. The U.S. has deployed Tomahawks in a variety of situations in which it might not have engaged in other ways, such as the use of ground troops. But we must have them to use them. As the number of cruise missiles declines in the absence of replacements, each missile becomes more precious and the cost of using it goes up. What if we need Tomahawks for an unforeseen but far more extensive conflict than current ones? As the remaining supply dwindles, each decision to deploy the Tomahawk becomes more difficult for military commanders, all the way up to the commander in chief. What happens when the only acceptable response to a given situation requires the use of a highly effective, standoff weapon? If a cost-benefit calculation forestalls the use of Tomahawks, the U.S. is left without its best option. We should not put our military commanders and the commander in chief in that situation. All-or-nothing choices are likely to lead too often to doing nothing. Inaction in turn can contribute to our adversaries’ perception that we lack the will to engage, and our ability to deter our enemies suffers. The current administration and Congress have put in place a substantial increase in military spending. The 2018 budget saw an increase of $61 billion over 2017, with an additional $16 billion planned for the 2019 budget. These plus-ups are sorely needed and are being deployed in positive ways, including increases in ballistic missile defense funding and the Navy’s shipbuilding budget. Assistant Secretary of the Navy James Geurts recently told Congress that under current plans and budget assumptions, the U.S. could go from a 282-ship Navy to a 355-ship Navy as early as the 2030s. This will increase the nation’s force projection capabilities and reinforce the U.S. conventional deterrent. However, the lack of a flexible strike capability provided by the Tomahawk severely limits the deterrent benefit of additional ships. Adding ships without purchasing missiles is a bit like building tanks with no shells or sending infantry into combat with rifles, but no ammunition. One Aegis destroyer and one Ohio-class submarine have the capacity to carry up to 250 cruise missiles combined. 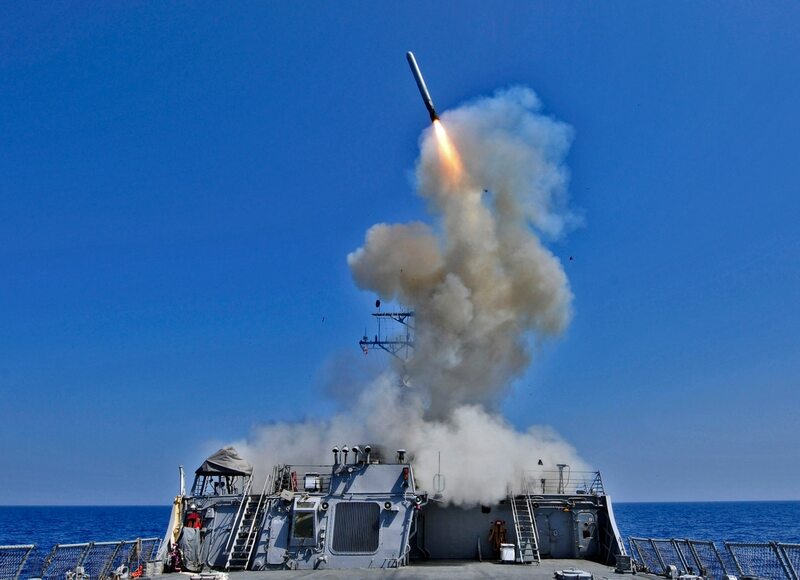 As new ships are put into the water ― and if the U.S. continues to utilize Tomahawks at historically average levels ― the U.S. Navy might need thousands of missiles over the next decade or more. As Congress continues its work on the 2019 National Defense Authorization Act, it should reconsider ending the production of new Tomahawk cruise missiles. If it does not, we may one day find ourselves in a situation where we have the will to strike an adversary but lack the best means to do so. Jonathan Bergner is an independent national security policy analyst.